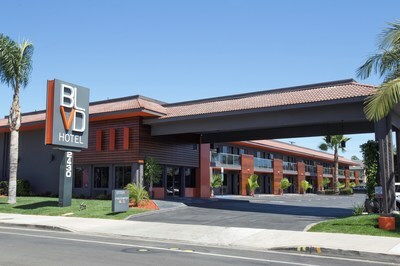 ROCKVILLE, Md., May 14, 2018 /PRNewswire/ -- The BLVD Hotel in Costa Mesa, Calif. is the latest hotel to join the Ascend Hotel Collection by Choice Hotels International, Inc. (NYSE: CHH), one of the world's largest hotel companies. Known for inspiring individuality, the Ascend Hotel Collection is the first and largest global soft brand, featuring best-in-class unique, boutique and historic hotels and resorts. There are more than 200 Ascend Hotel Collection member hotels worldwide. The BLVD Hotel participates in the award-winning Choice Privileges loyalty rewards program, rated no. 1 in USA Today's 10Best Readers' Choice Awards list for two consecutive years. Membership is free, offers fast rewards, instant perks, and exclusive member rates when booking direct at www.choicehotels.com. Members can redeem points towards free nights, airline miles and more, while staying at any of Choice's global brand hotels, including the Ascend Hotel Collection, Cambria Hotels, Comfort Inn, Comfort Suites, Sleep Inn, Quality Inn, Clarion, MainStay Suites, WoodSpring Suites, Suburban Extended Stay Hotel, Econo Lodge, and Rodeway Inn. Choice Hotels International, Inc. (NYSE: CHH) is one of the world's largest hotel companies. With over 6,800 hotels franchised in more than 40 countries and territories, Choice Hotels International represents more than 550,000 rooms around the globe and as of March 31, 2018, there are more than 900 hotels were in our development pipeline. Our company's Ascend Hotel Collection®, Cambria® Hotels, Comfort Inn®, Comfort Suites®, Sleep Inn®, Quality®, Clarion®, MainStay Suites®, Suburban Extended Stay Hotel®, WoodSpring Suites SM, Econo Lodge®, Rodeway Inn®, and Vacation Rentals by Choice Hotels™ brands provide a spectrum of lodging choices to meet guests' needs. With more than 36 million members, our Choice Privileges® rewards program enhances every trip a guest takes, with benefits ranging from every day rewards to exceptional experiences, starting right when they join. All hotels and vacation rentals are independently owned and operated. Visit us at www.choicehotels.com for more information.